By virtue of having a blog, there have been some interesting requests I've received over the years. They range from promising me increased traffic to invitations to try a smartphone for 30 days for the purposes of taking food pictures (why do I need a phone for 30 days when I already have a phone???). 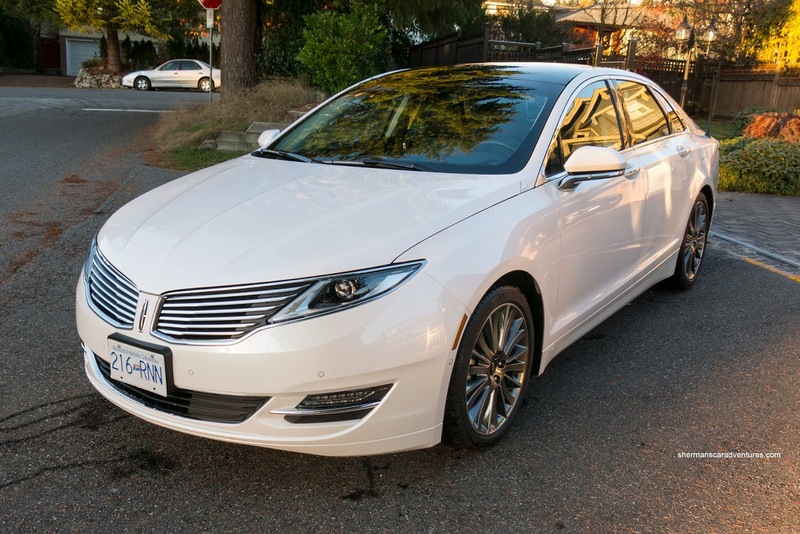 Anyways, one request was to drive Lincoln MKZ for a couple of days and have dinner on them. What's the catch? Well, I guess it meant I was merging food with cars in a post. 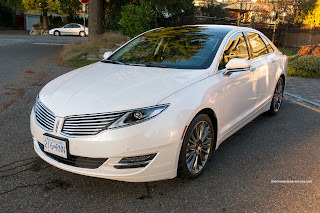 Seeing how I love cars as much as I love food, I am going to post a more comprehensive review of the Lincoln MKZ on a separate site (a bit later). But for now, let's just say I was completely surprised by the car. For me, I always associated Lincoln with an older, more conservative demographic. In fact, I've driven the old town car many times as part of a wedding party (not particularly impressed). But the MKZ is nothing like that. 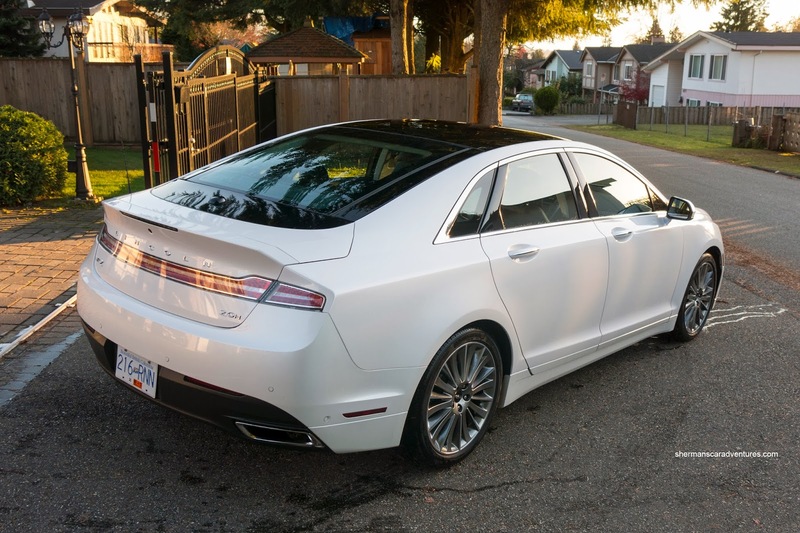 With big 19" optional wheels, a minimal wheel gap and modern styling, this Lincoln has younger buyers in mind. I was supplied with the hybrid version of the car and it was thrifty on gas and heavy on the luxuries. Let's just say I didn't expect to be won over by a Lincoln. 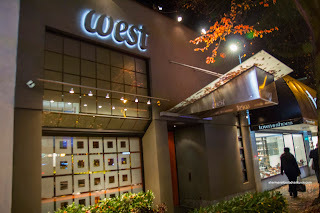 Onto where we drove this Lincoln to dinner - West Restaurant & Bar. Viv and I have been meaning to do a return visit for 5 years because our initial meal was not representational of the restaurant. We had originally gone there for Dine Out, but really, that was not a fair assessment of the place. 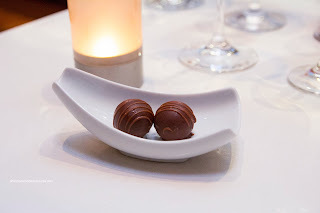 Hence this time around, she had the Sea Tasting Menu while I had the Land Tasting Menu complete with wine pairings. To start off, we were presented with 3 types of bread accompanied by butter and olive oil. Of note, the olive oil was very flavourful. 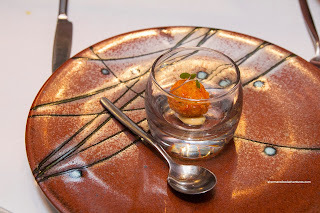 Next was an amuse bouche consisting of a Crab Croquette with Meyer lemon emulsion. 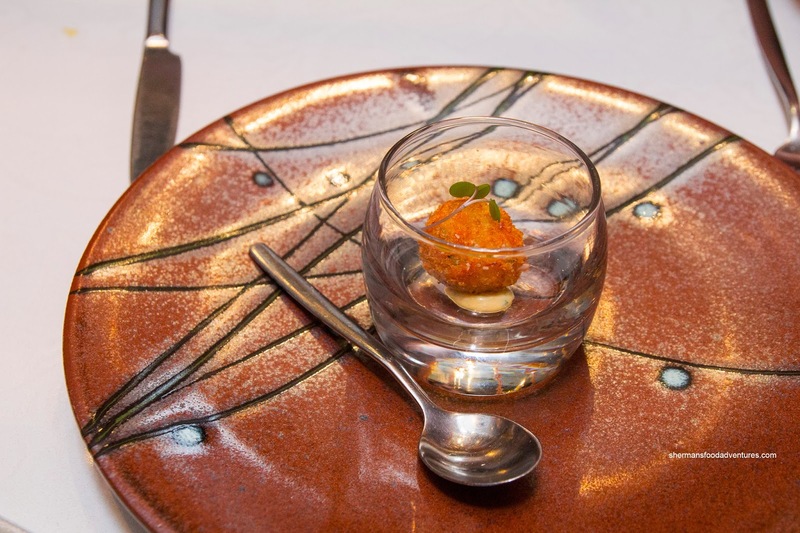 The little ball was full of natural crab flavour albeit salty (accented by the emulsion though). The exterior was really crunchy which gave way to a mix of fluffy and chewiness. 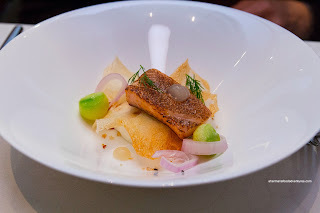 Viv's first course was the Langley Organic Trout which was lightly charred until crispy and smoky. The flesh was slightly rare and super moist. Accenting the dish was creme fraiche, cucumber balls, red onion, dill and potato crisps. 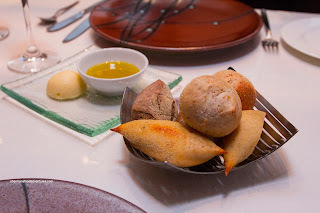 This was paired with Taittinger "Brut Reserve" which was light, fruity and refreshing. To start the land tasting menu, I had the Beef Tartare seasoned with sweet onion and soy, sesame and shallots. Nori and nori crisps provided the crunch to go with the smoothness of the meat. 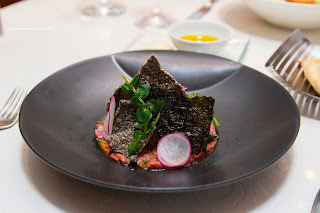 I thought the tartare was expertly seasoned with a good ratio of savoury and acidity. A glass of Adami Prosecco "Bosco di Gica" added a crisp bite to accent the dish. 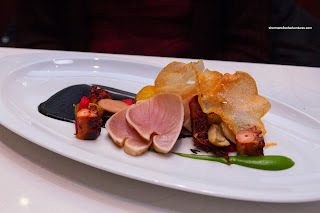 Next up on the sea tasting menu was the Albacore Tuna with octopus chorizo, black olive puree, green onion, puree, golden Yukon potatoes and potato crisps. As evidenced in the picture, the tuna was seared slightly exhibiting a smoky aroma. The star of the plate was the octopus chorizo as they were tender, spicy and salty (in a good way). The glass of Laughing Stock Pinot Gris 2011 was a nice sweet fruity contrast to the saltiness of the dish. My second course was the Twice Cooked Foie Gras with toasted Agassiz hazelnuts, green strawberries, green strawberry jam, chocolate ganache and brioche. 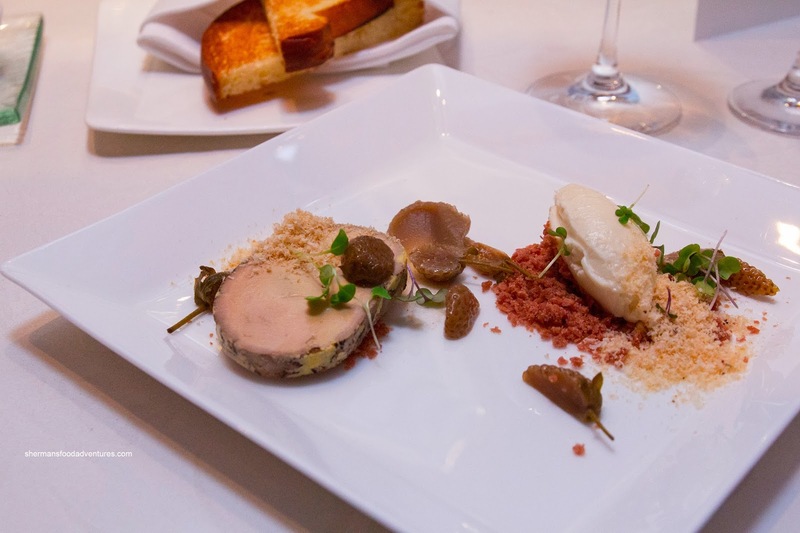 The significantly-sized portion of foie was smooth, swet and rich with a slight seasoning of 5-spice on the outside. The tart jam and strawberries added the necessary tartness to cut through the richness. Serving the same purpose, the Pfaffenheim Gewurztraminer 2011 added some refreshing mild fuity notes with a strong finish. Moving on, Viv had the Diver Caught Scallops glazed with Maple jelly accompanied by celeriac puree, celeriac and caramelized onions. 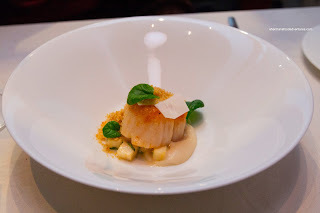 The large buttery scallop was seared a golden brown with a slight exterior crispiness which was sweet and smoky. The celeriac added a background Earthiness. Paired with this dish was Grunderloch "Fritz's" Riesling 2011 that was sweet and floral. 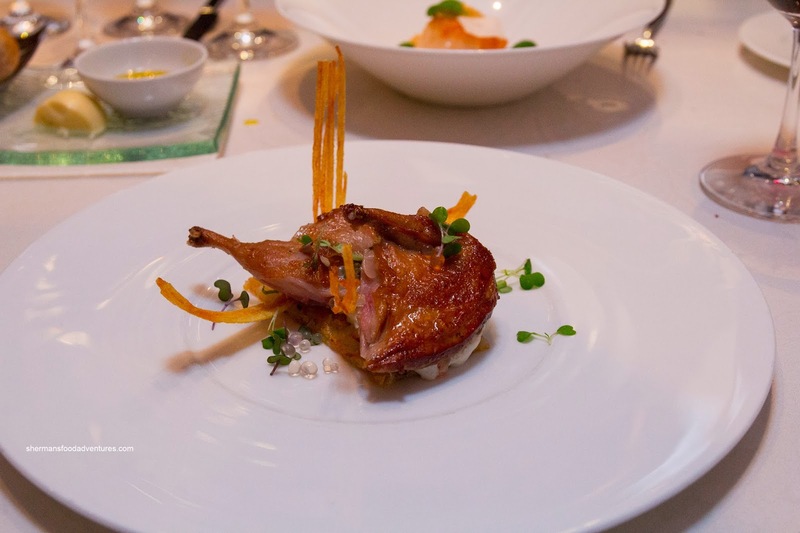 For myself, I had the espelette glazed Thiessen Farm Quail with potato and herb rosti, chevre, vanilla honey gelee and lavender pearls. Being a beneficiary of a lovely brine, the quail was moist and flavourful. The skin was nicely rendered displaying a light crispiness. Both the gelee and pearls were so mild as well as the chevre, hence, the quail stood on its own. 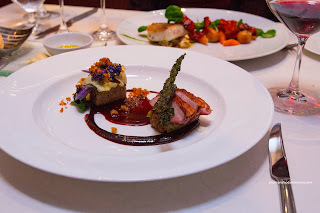 The full-bodied glass of Hartford Court "Land's Edge" Pinot Noir 2006 with cherry notes was a nice match with the quail. 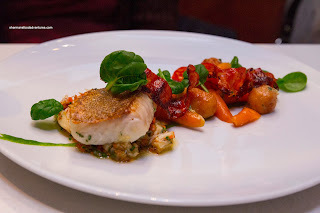 Heading into the homestretch, Viv had the Line Caught Ling Cod with chorizo "bacon", Helmer potatoes, heirloom carrots, green onion puree and a crab vinaigrette. Essentially, the ling cod couldn't have been prepared any better as it was flaky and moist highlighted by a super crispy skin. It rested upon a really tasty crab vinaigrette with large fluffy chunks of crab. The chorizo bacon added both crunch and that extra oomph to an otherwise delicate dish. Appropriately, this was paired with a light and fruity Laroche "La Chantrerie" 1er Cru Chablis 2011. My last savoury dish was the Yarrow Meadows Duck consisting of confit leg cabbage roll atop financier cake and seared duck breast. This was done in a "Peking"-style with a hoisin-based sauce in addition to a coronation grape jus. The duck breast was peppery, nicely roasted and minimally fatty while the cabbage roll was tart with well-seasoned and moist duck. This was paired with Ken Wright Cellars Pinot Noir 2010, which to me, was a bit weak. As a palate cleanser, we were presented with a Blueberry Sorbet with a slice of quince. This was really sweet featuring concentrated flavours. We were pretty surprised as blueberry is normally quite mild. The quince added some tang to go with the sweetness. 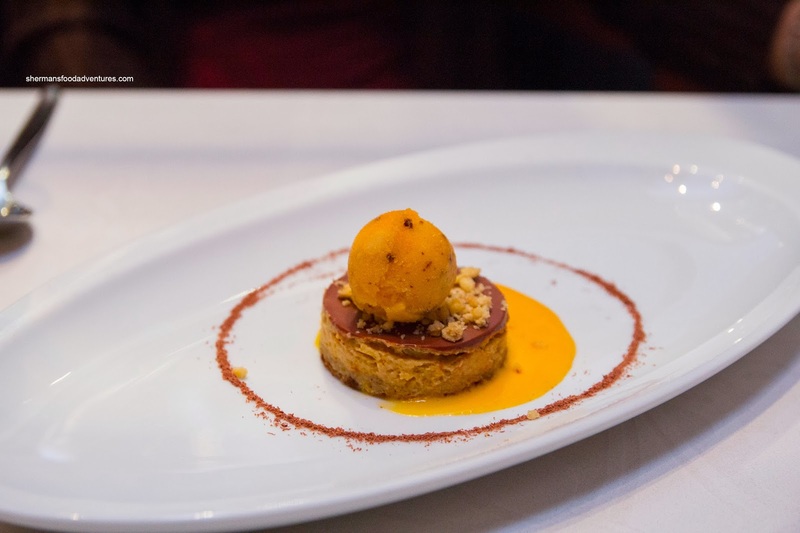 For dessert, Viv had the Spiced Squash Cheesecake with a banana base, chocolate ganache and orange squash sorbet. This was a remarkably light cheesecake that was easy on the sweetness. 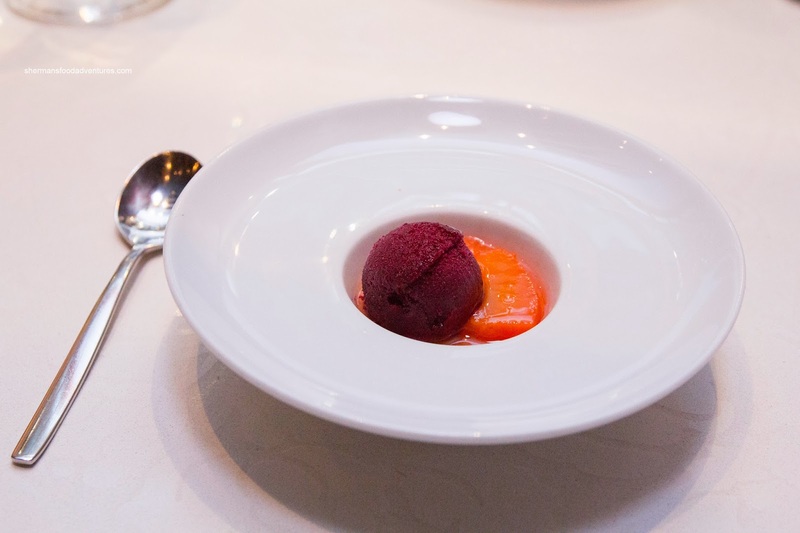 The orange sorbet and sauce added brightness and citrus while the crunchy bits afforded textural contrast. A glass of Chateau d'armajan Sauternes 2006 had tempered sweetness. For myself, I had the Almond Blancmange consisting of apple oat cake, pomegranate fruit salad and earl grey sorbet. The syrup-soaked cake was a bit dense for my liking (but it was made with oat...), yet it wasn't too sweet. 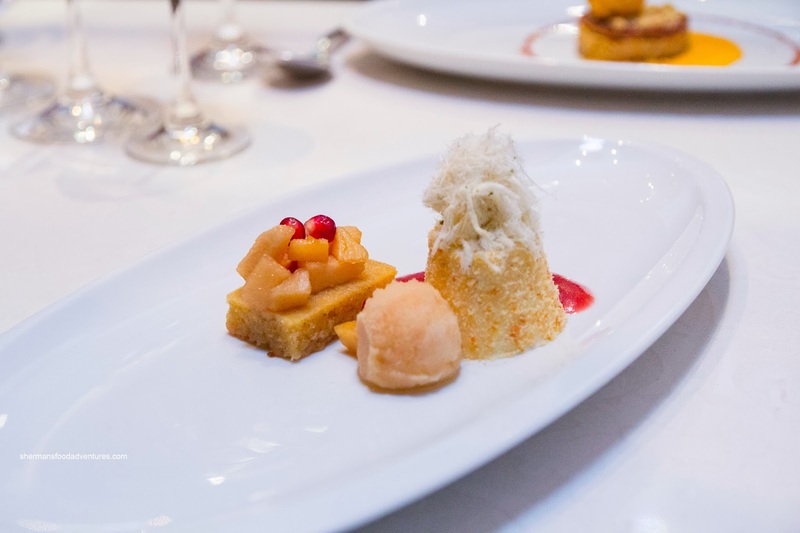 The side of panna cotta was smooth and creamy where it was topped with Turkish cotton candy and accented by apple cranberry coulis. This was paired with Quail's Gate Late Harvest Optima 2011 which was just sweet enough that it didn't interfere with the dessert. Unlike my previous visit to West (which was not really all that representational), we finally got the real deal. The food was intricately prepared and beautifully plated. We found the wine pairings to be thoughtful and mostly spot-on. Combined with an attractive dining space with attentive service to match, there was much to like about our meal at West. Again, thanks to Lincoln for picking up the tab for this meal.